It is the product, which in fermentation is not susceptible to be enriched with other sugars different than those obtained from Blue Tequilana Weber blue variety grown within the territory indicated in the Declaration. For this product to be considered “Tequila 100% agave” must be bottled in the packing facilities controlled by an Authorized Producer. Packing facilities shall be located within the territory indicated in the Declaration. This product must be denominated through some of the following legends only: “100% de agave”, “100% puro de agave”, “100% agave”, “100% puro agave”. It is the product in which must is susceptible to be enriched and mixed jointly prior to fermentation with other sugars until a proportion not higher than 49% of total reducing sugars expressed in mass units. This maximum enrichment up to 49% of total reducing sugars expressed in mass units cannot be performed with sugars coming from any other agave variety. 51% of total reducer sugars can be increased with sugars extracted from the Agave tequilana Weber variedad azul grown within the territory defined in the Declaration only. This product must be bottled in packing facilities located within the territory defined in the Declaration and can only be bottled out of this territory when provisions set forth by NOM are met. Silver / White Tequila.- Commercial alcoholic content must be, in its case, adjusted with dilution water. Young or Gold Tequila.- Susceptible to be aged. Its commercial alcoholic content should be, in its case, adjusted with dilution water. Blending white Tequila with aged and/or extra aged and /or ultra/ aged tequilas, it is considered as young Tequila or gold Tequila. Process to soften Tequila flavor is called “Abocado”, adding one or more of the following ingredients: caramel color, oak natural extract, and glycerin and sugar syrup. Aged Tequila.- Product susceptible to be softened subjected to an aging process of two months at least within oak or white oak barrels or casks. Its commercial alcoholic content must be, in its case, adjusted with dilution water. Tequila aging is understood as the product slow processing that allowing acquiring additional sensory characteristics, gotten by physicochemical processes that naturally occur during their stay in French oak or white oak barrels. Rested Tequila must be aged in French oak or white oak barrels for at least two months. 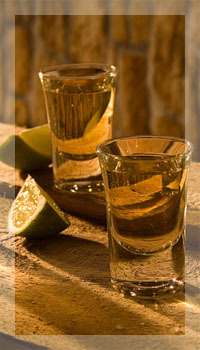 Blending rested Tequila with extra aged or ultra aged Tequila, it is considered Aged Tequila. Extra Aged Tequila.- Product susceptible to be softener subjected to an aging process of one year at least in 600 liters capacity French oaks or White oaks barrel. Its commercial alcoholic content must be, in its case, adjusted with dilution water. Mixing aged Tequila with ultra aged Tequila is considered Extra Aged Tequila. Extra aged Tequila may be rested in French oak or White oak barrels for one year at least. The barrels cannot be more than 600 liters. Blending extra aged with ultra aged Tequila is considered as Extra Aged Tequila. Product susceptible to be softened, subjected to an aging process of no more than three years. Aging time is not specified in label. Matured in direct contact with French oak or White oak casks of no more than 600 liters capacity. Its commercial alcoholic content must be, in its case, adjusted with dilution water. • "Extra aged" instead of Añejo. • "Ultra aged" instead of Extra Añejo.